Adi is a graduate of the Art History program at Tel Aviv University and is an M.A candidate at NYU’s Visual Arts Administration program. On the sunniest day to date, I went to see Aircraft Carrier, an exhibition currently showing at the Storefront for Art and Architecture. Upon entering, I noticed that the space was washed with a warm New York light, illuminating the works with a glow that seemed almost sacred, something I found ironically befitting as this exhibition criticizes cultural principals which, in Israel at least, seem to have been cherished to near sacredness. In this exhibition, the curators, Milana Gitzin-Adiram, Erez Ella and Dan Handel, insightfully crafted a fascinating commentary on Israeli society, examining it through the lens of architecture and urban space. 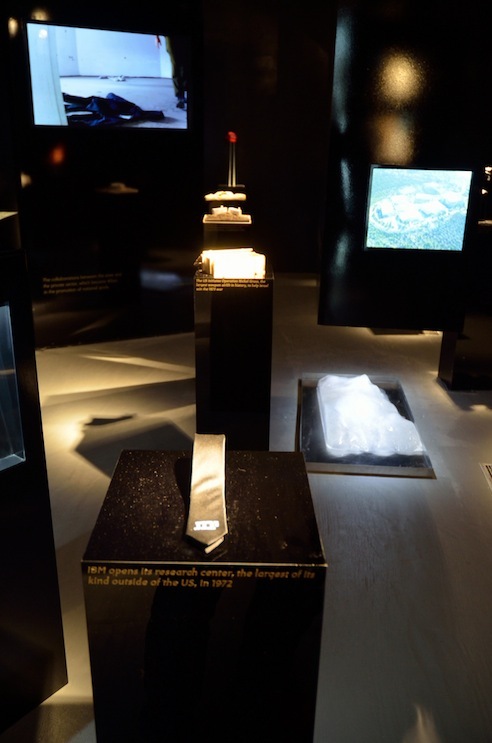 The crux of the exhibition is an investigation of the period spanning from 1973 to 2008- two pivotal points in global economy that have affected Israeli society in particular. More specifically this show asks to examine the ways in which these global events have influenced Israeli reality and how this is expressed in the built environment; the use of architecture and urban space as methods of investigation helps to create a critical deconstruction of these events and their implications on each of our lives. 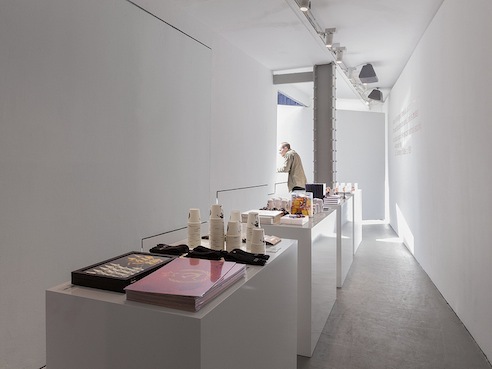 For the purpose of this show, Storefront’s space was divided in two; the atrium was converted into a ‘concept store’ filled with playful objects; leading to the main space hosting photos, videos and three-dimensional works. The full meaning of the objects in this introductory space only becomes clear after viewing the show, and it is rather refreshing to go back and forth between the two spaces, and attempt to decipher the concepts on display through this inter-connectivity. 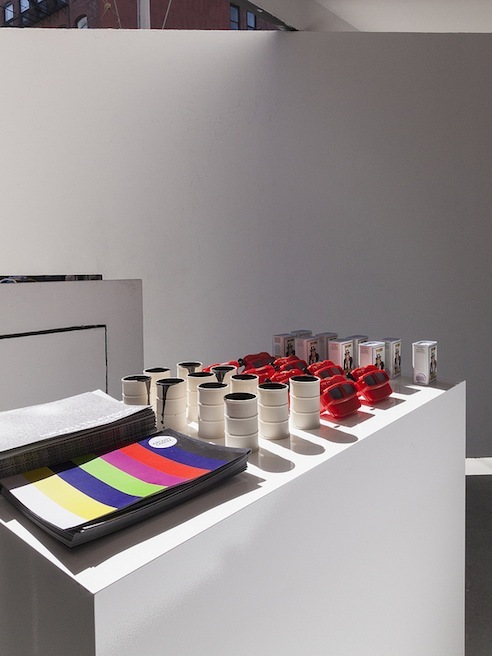 The main space, designed as a long, narrow room, hosts a variety of works by Israeli and international artists; the three-dimensional objects are placed on black pedestals that are dispersed throughout the space while video and photography are screened or hung on the gallery’s walls now painted black. When entering this space, a multitude of visual elements is revealed and as much as the eye tries to capture the space in its entirety, the more the installation resists it. The further one delves into the space the deeper the understanding that the relationship between objects and space- much like the subject matter of the show- cannot be consumed within one’s flick of the eye and requires further consideration. As you navigate through the space, the intention of the curators starts unraveling, and the individual art works achieve their full meaning. 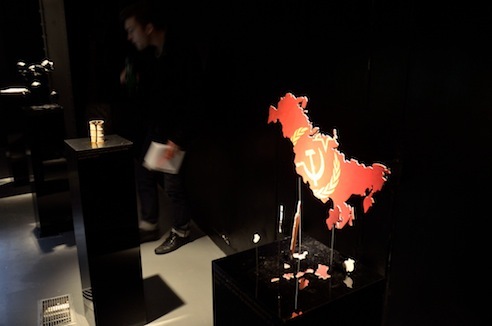 Most of the pieces in the show, and their juxtaposition, deal-in one way or another- with the transition from a socialist-welfare model to the hyper- capitalism Israel underwent under the influence of the United States. It is intriguing to discover the extent of this change–which as the show points out—is expressed in almost every stratum of Israeli life. 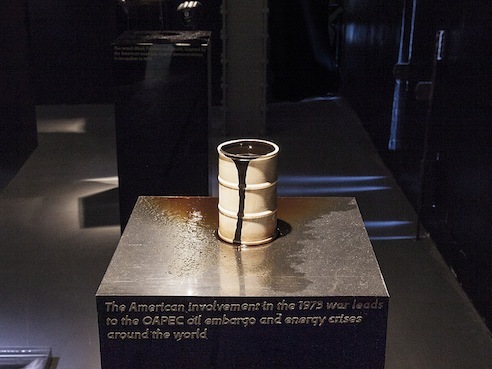 The artworks on display vary in aesthetics and accessibility to the viewer, some are characterized by a simple, delightful, straight- forwardness such as a fictive monopoly board mapping the privatization of Israeli space, a miniature leaking oil barrel which immediately reminds us of the 1973 energy crisis that followed the Yom Kippur War, or pieces of a puzzle forming the shape of the former Soviet Union which refers to the final collapse of Communism and to the arrival of over one million immigrants to Israel in the 1990’s. Other works are more elusive and insinuated, the photographs by Assaf Evron and Florian Holzherr being the most remarkable. 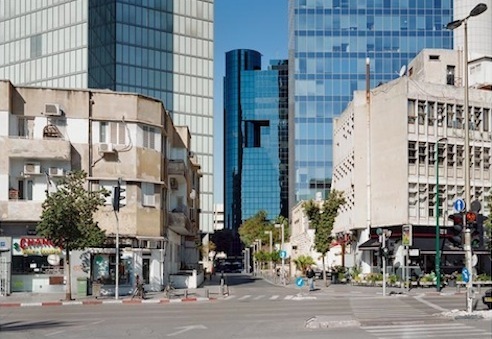 Evron’s photos- executed with a superb sensitivity to the built environment- present the trajectory of urban development in contemporary Israel and the deployment of urban space as it is dictated by private developers. 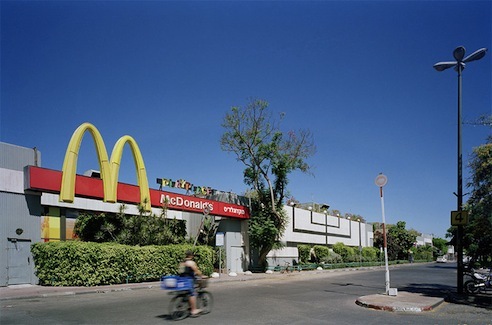 Holzherr‘s photos, present grand shopping malls (as grand as they can be in Israel), and serve as a painful attestation to the transition Israeli society has undergone from a modified version of socialism to neo-liberalism and hyper consumerism. The fact that many of the pieces have a humorous twist, a playful character or a cynical tone serves as a reminder of the frustration of a generation who experienced this transition first- hand, and is currently experiencing the consequences of the failures of the neo-liberal system. At this point the meaning of the objects sold in the store is crystalized, and they are illuminated as signifiers of the background story for these dramatic changes. 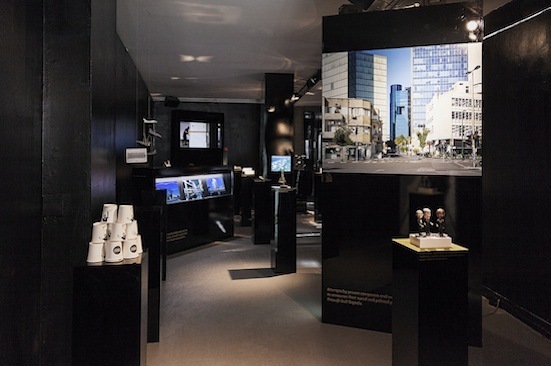 Thus, within the framework of the store, reproductions of the objects in the show are being sold. The viewer then understands that he is offered the opportunity to participate in the installation as well as the social commentary, in an almost performative engagement through the act of consumption. Especially intriguing is the choice of exhibiting such a show (that quite overtly criticizes America’s capitalist agenda and its influence on Israeli society) in the heart of SoHo- a hub for consumerism and a celebration of capital and commodity— which adds another layer of symbolism, or meaning, to the topic under discussion. This however, brings to mind questions regarding the American viewers’ capacity to fully comprehend the conceptual span this exhibitions deploys. Although the wall labels provide an historical context, it is reduced to a minimum of factuality and one must wonder if an audience not familiar with the extent of the issues under discussion could really understand how significant these architectural evidences are, especially in the current socio-political climate. All pictures are courtesy of Storefront for Art and Architecture, New York.